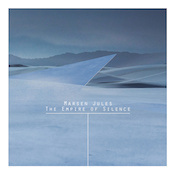 You could hit the internet and look up whether or not the Inuit actually have a bunch of names for different types of snow, or you could take Marsen Jules’ word for it and dive into his interpretation of nine of those words on The Empire of Silence. I don’t know that there is much more to do here than sit back and let these ambient sounds drift quietly around you. Marsen’s very patient constructs melt easily one into the next. An hour passes without much to mark the time. (An hour and a half if you get the 38-minute bonus track.) You just get a little lost in the steadiness of the drifts and the overall calm. Here and there sounds may glimmer a bit and a chord might rise up for a moment of notice, but otherwise it simply breathes around you and carves out a nice, quiet spot. While The Empire of Silence is a quite beautiful album, it’s also one that seems content to rely on its simplicity. Definitely one to use for your next meditation session, or just to let loop at low volume as you go about your business. It is soothing and pleasant, but doesn’t necessarily hold up to close scrutiny.